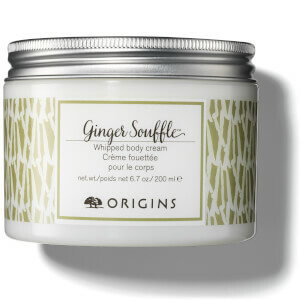 Nourish your skin with Origins Ginger Rush Moisturiser, a deeply hydrating body cream with a rich, luxurious texture. Delivering a veil of comfort, the lotion massages effortlessly into skin, working to soften, smoothen and intensely moisturise. It's lively scent, powered by a blend of Ginger, Lemon, Lime and Bergamot Essential Oils, leaves you feeling energised and reawakened. Skin feels sumptuously soft and supple. Water\Aqua\Eau, Butyrospermum Parkii (Shea Butter), Glycerin, Zingiber Officinale (Ginger) Root Oil*, Elettaria Cardamomum Seed Oil*, Coriandrum Sativum (Coriander) Fruit Oil*, Eucalyptus Globulus Leaf Oil*, Eugenia Caryophyllus (Clove) Bud Oil*, Citrus Aurantifolia (Lime) Oil*, Citrus Aurantium Dulcis (Orange) Peel Oil*, Citrus Aurantium Bergamia (Bergamot) Fruit Oil*, Citrus Grandis (Grapefruit) Peel Oil*, Citrus Limon (Lemon) Peel Oil*, Litsea Cubeba Fruit Oil*, Eugenol, Linalool, Citronellol, Citral, Limonene, Geraniol, Cetearyl Alcohol, Butylene Glycol, Octyldodecyl Myristate, Octyldodecyl Neopentanoate, Cetyl Esters, Isostearyl Neopentanoate, Pentylene Glycol, Cetyl Alcohol, Cetearyl Glucoside, Theobroma Cacao (Cocoa) Seed Butter, Zingiber Officinale (Ginger) Root Extract, Persea Gratissima (Avocado) Oil, Prunus Amygdalus Dulcis (Sweet Almond) Oil, Theobroma Grandiflorum Seed Butter, Tocopheryl Acetate, Olea Europaea (Olive) Fruit Oil, Prunus Armeniaca (Apricot) Kernel Oil, Vitis Vinifera (Grape) Seed Oil, Oryza Sativa (Rice) Bran Oil, Sodium Hyaluronate, Panthenol, Myristyl Myristate, Dimethicone, Methyl Glucose Sesquistearate, Caprylyl Glycol, Acrylates/C10-30 Alkyl Acrylate Crosspolymer, Phosphoric Acid, Aminomethyl Propanol, Stearic Acid, Xanthan Gum, Phenoxyethanol *Essential Oil.